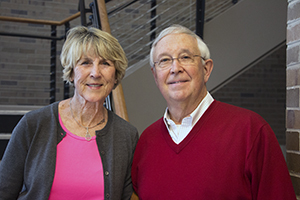 Larry and Jane Richards have donated $25,000 to endow a scholarship for an Indiana University East tennis player, the proceeds of which will be matched annually by Indiana University to create a $2,250 annual scholarship. The scholarship will be named after distinguished IU East alumna and accomplished professional tennis player Venus Williams and will help support a participant in IU East’s intercollegiate tennis program for up to four years. Williams was the first student to graduate under the agreement that IU East has with the Women’s Tennis Benefits Association (WTBA). The WTBA agreement supports WTA players who wish to complete their bachelor’s degrees while continuing to play professionally. The agreement makes IU East the sole provider of online bachelor degree level education for WTA players. Lisa Grattan, chairperson of the Women’s Tennis Benefits Association, thanked the Richards for their gift in recognition of Williams. IU East’s men’s and women’s tennis teams were added to the athletics program in 2009-2010 academic year. At the time, the addition of the programs brought IU East’s intercollegiate teams to eight; now there are 15 programs for student-athletes. Both programs have earned notable accomplishments. The IU East women’s tennis team qualified for the River States Conference championship match in 2011 and 2017. The IU East men’s tennis program received the 2017 Buffalo Funds Five-Star Champions of Character Team Award, the National Association of Intercollegiate Athletics’s (NAIA) “national championship” for Champions of Character efforts. The IU East tennis program has earned numerous NAIA Scholar-Team awards for team GPAs of 3.00 or better since its inception. Larry Richards served as executive vice chancellor for Academic Affairs at IU East during the period 2004-15, with a one year appointment as interim chancellor (2012-13). Jane Richards was an adjunct lecturer in mathematics over this period of time. They are now both retired. This gift will count toward the $3 billion campaign, For All: The Indiana University Bicentennial Campaign. IU East’s campaign goal is $7 million, which will help fund a variety of campus initiatives, student scholarships and strategic projects. Find out more about IU East and ways to assist the campus at iue.edu/development. For All: The Indiana University Bicentennial Campaign is taking place on all IU-administered campuses including IU Bloomington, IUPUI, IU East, IU Kokomo, IU Northwest, IU South Bend, and IU Southeast. The campaign will conclude in June 2020 to coincide with IU’s bicentennial year celebration. To learn more about the campaign, its impact, and how to participate, please visit forall.iu.edu.